Lady and the Blog → Living → I Went To Bat For The ‘Boys And Girls Club Of America’ And State Farm Donated $3,000 In My Name! I Went To Bat For The ‘Boys And Girls Club Of America’ And State Farm Donated $3,000 In My Name! There is a FANTASTIC State Farm initiative happening RIGHT NOW that I just have to share. You can play along to decide where the money will go. So fun! Through the Go To Bat program, an online, charitable initiative driven by State Farm’s commitment to helping communities get to a better state, you can support the causes that mean the most to you and take a shot at winning one of the $18,000 weekly donations for your favorite charity PLUS a trip for two to the 2011 World Series. Miss Mandy Moore even got involved with the fun! 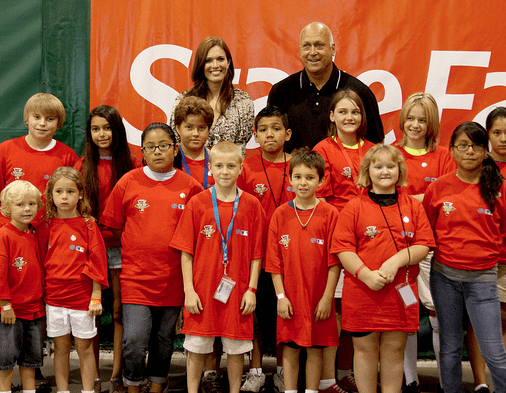 Here she is with Cal Ripken Jr. when they met with the Phoenix-area Boys & Girls Clubs kids to bring awareness to State Farm’s charitable Go To Bat initiative. You actually play baseball online!! It’s a fun way to get involved. Think pinball. 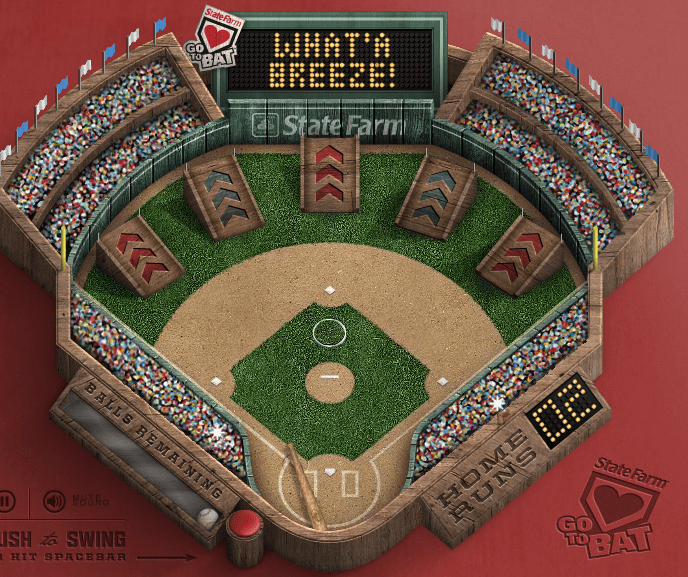 You swing the bag with your space bar and hope for a home run. 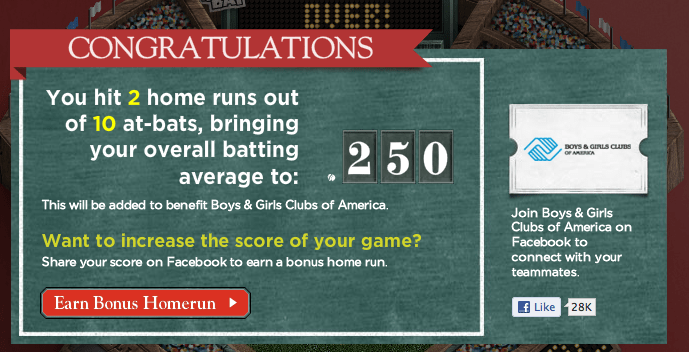 The more home runs you hit, the better your charity will do. My batting average… wasn’t so hot. But at least I tried! I snuck in an extra home run by sharing my score on Facebook. Here’s the best part – State Farm donated $3,000 to the Boys and Girls Club of America for ‘Lady and the Blog‘ !!! I am so stoked to hear this because I’ve been working with that organization for a least 5 years now. I’ve become very friendly with Rick & Susan Goings and their wonderful team. Growing up, my mother always told me about how she used to spend a lot of time at the Boys and Girls Club in the city. It was a safe place to go when there wasn’t a lot to do. It’s the place where children go to stay out of trouble and I am so thankful that they exist around the country. So many times you hear stories about how these clubs “saved” someone from a life of bad decisions. Usher and Denzel Washington are both extremely vocal about the influence the ‘Boys and Girls Club of America’ had on their lives. This is why I chose them as my charity. It’s an HONOR to be part of State Farm’s charitable game. Want to play along? Click here to get started!!!! Boys and Girls Club of America is a great organization…so wonderful that State Farm donated big bux on behalf of Lady & the Blog! love love love the boys and girls club….this is a great idea!! !